Selecting your scarf is easy. 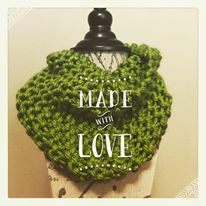 Browse through the styles below and select the style and color of preference (we suggest you list your top two color choices) then contact us through our online request form or email us at craftdwithlove@gmail.com. Once your request has been received and processed we will send out the scarf of your choosing. Please keep in mind that due to the high volume of requests your first choice of color may not be available. Shipping may take 3-6 weeks depending upon stock and demand. At this time we can only ship within the USA, no international shipping. We will email you as soon as your scarf is on it's way! This style is worn close to the neck and is very cosy. The back of the scarf can be pulled over the head to form a cowl keeping your head warm as well. The traditional scarf with or without fringe. This scarf can be worn in many different ways. Is this scarf for a child or adult?